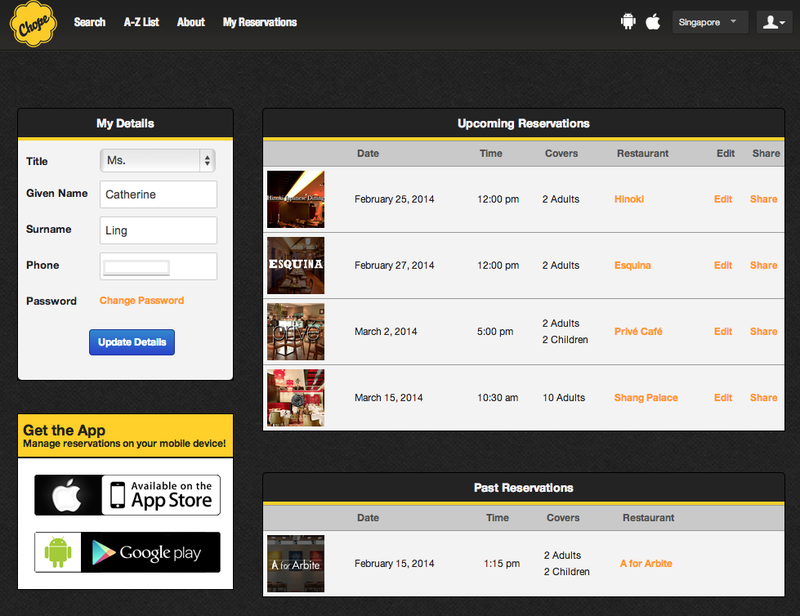 Chope Online Reservations Website/App: Restaurant Table Bookings Made Easy! See How Mine Went at "A For Arbite"
I have a confession. I hate making reservations. Having to pick up the phone alone is a hassle, what more waiting sometimes endlessly for someone to answer. And I know I am not alone in this. I have readers who will write in and ask me all kinds of things about a restaurant instead of calling the restaurant to find out. And then they ask me if they really need reservations. I also did not pay much attention to online reservations services. But I recently tried out the most well-known one - Chope. Wow. I'm quite blown away - by how gorgeous the site is, and how well-organised it is. 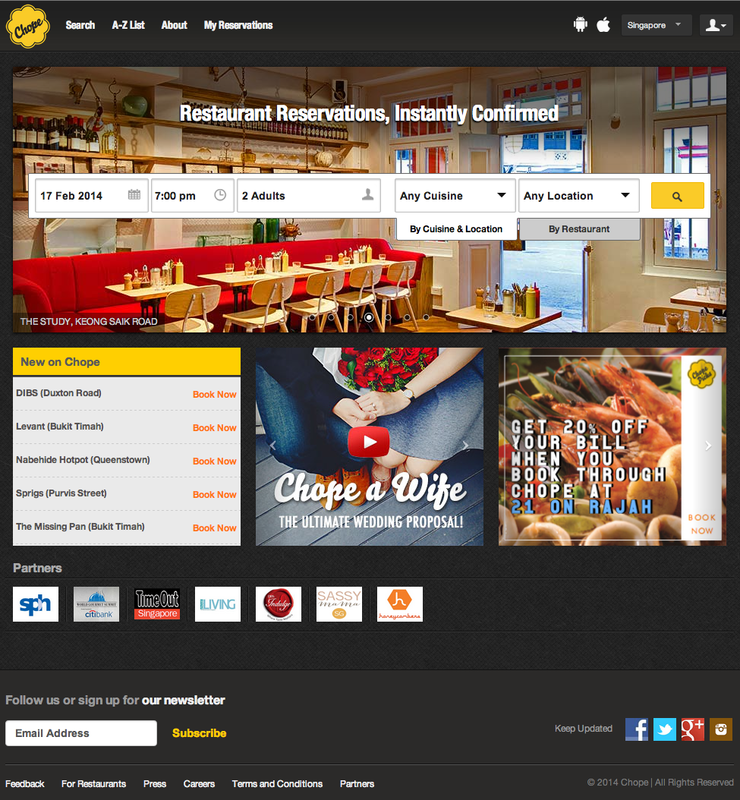 They've made it very simple to navigate the site, search for restaurants, make/change/delete bookings. Clean, simple and effective. You search firstly by cuisine and location, or restaurant name if you already have a place in mind. 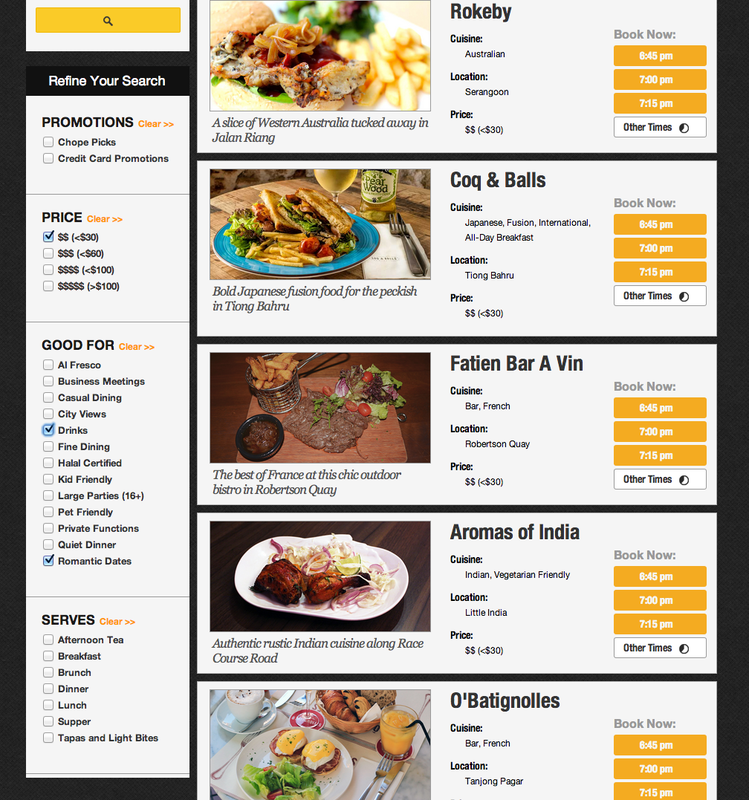 If you're still undecided about where to go, the site is a great way to look up and discover new restaurants too. There are 250 eateries with more being added every week. The results come out very quickly, and all the listings are laid out with stunning pictures, key information and suggested booking times. Cuisine and location may be the key search criteria, but you can further refine your search results by promotions, price range, functions and meal types. 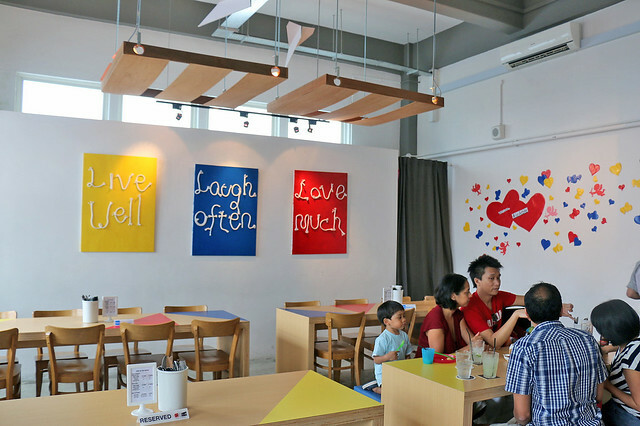 This (above) is a result for all cuisines, all locations that are good for romantic dates and drinks that are easy on the wallet (S$30 or less per person). Well, I was going for a nice, casual place which serves all-day breakfast for the family. And I picked A for Arbite, a place I've been wanting to try for some time now (had promised Marc Wee I'd drop by from last year since they opened). 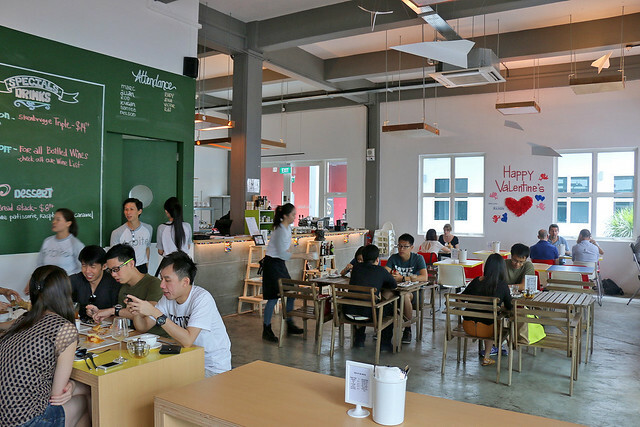 The restaurant listing page has more photos, all the pertinent information, map, and useful reviews from Chope itself and media. Many restaurants also put up their menus here - see the blue menu links above? That's so helpful, and not to mention enticing too! Making a reservation is really easy. Select number of pax, date and time, and just hit the big orange button - Book Now! You don't even need to sign up for the free account, but signing up will enable you to keep track of your bookings. If you have an account, all your details will be pre-filled, so you only really need to hit the Confirm button. Well, it's nice that you can enter special requests like dietary requirements too. The final confirmation will also be emailed to you, so you don't have to worry about copying down details. You can also send a copy to your friends to notify them. So you can make reservations any time of day, without worrying about whether the restaurant is open or not. And the confirmation is instantaneous. You can track all your upcoming and past bookings at the "My Reservations" page. This is where you can easily edit (including delete) or share your reservations. So now you are all set. But what if you need to change reservations while you are out and about? It's really convenient if you have their app (iOS and Android)! It's also useful to make bookings anywhere you are. I'm glad to say the app has the same clean layout. 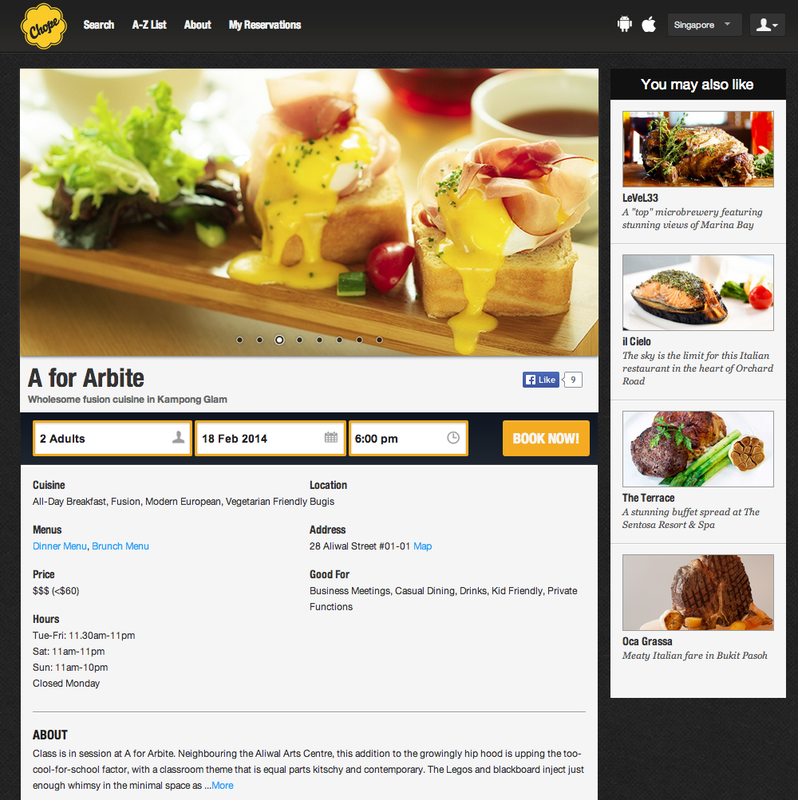 The restaurant listings and individual pages are lovely to scroll through and browse. The search function lets you refine your results according to more criteria, just like on the website. Booking is really simple too. Just a few finger taps. 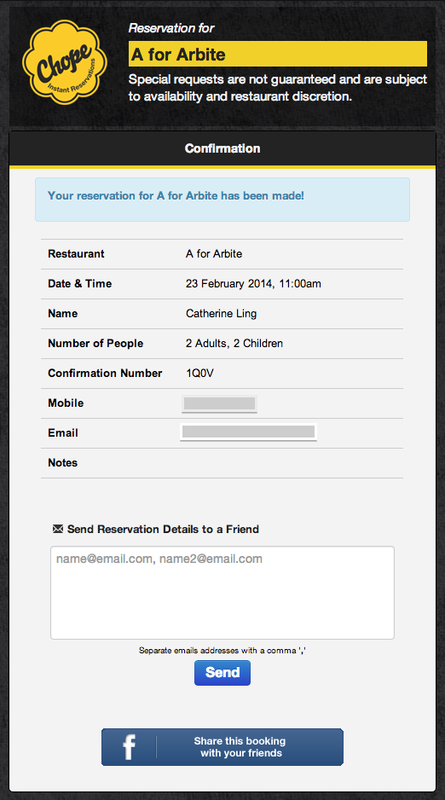 And if you need to change your reservation details, just tap, scroll and select. That's what I did. Just as a test, I changed the reservation time less than two hours before we were due to arrive. I got an instant confirmation. Did the restaurant also update its list? Why yes it did! I was curious at first, because the waitress was looking at a paper list with pencil scribbles. Well, somehow, they do manage to get the latest changes reflected. That's A for Arbite. This building was formerly a school, and it's nice that they kinda kept the feel. I'm glad we made reservations because they were pretty packed on a weekend. How appropriate to bring Jolie too, as she just started primary school. Fries are always a treat for kids. Truffle fries - the adult version! 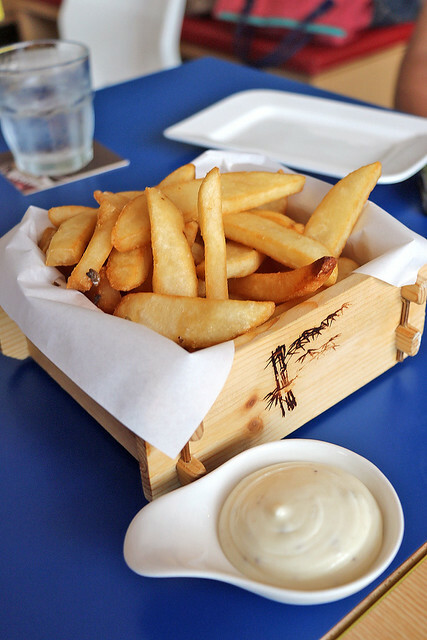 With truffle salt, truffle oil and a truffle infused dip, these fries smell great. First time I've seen truffle fries in chunky steak house fries format. Most places do them shoestring style. 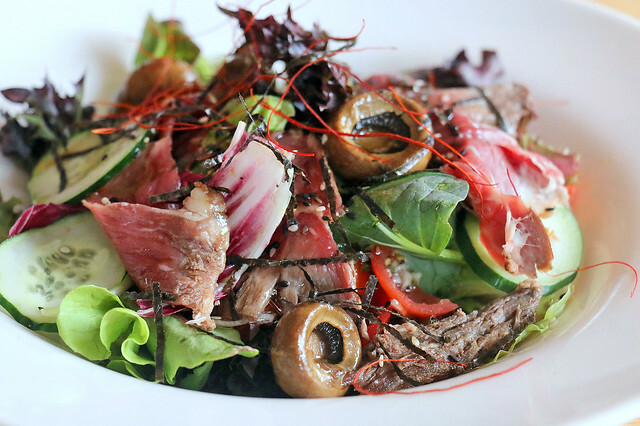 Sliced beef onglet served rare, sauteed mushrooms, pickled onions, Japanese cucumber all doused with a shoyu and wasabi dressing. 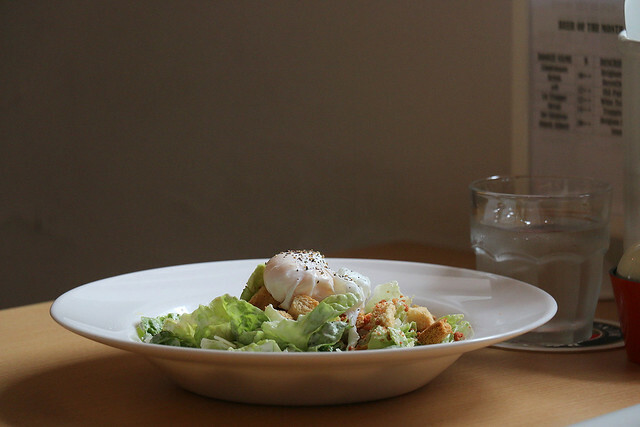 This strongly tangy and salty salad is not for the faint of heart. This is one of their signature items, so I had to try it. 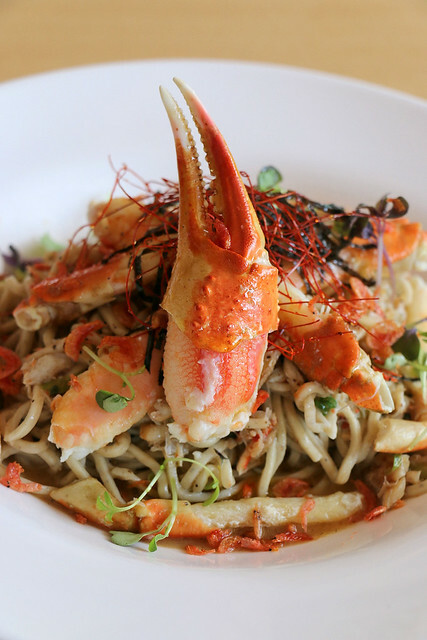 Green, pink and black pepper give the pasta an unusual fragrance, while the snow crab, seaweed and the dressing give it an Extreme Umami boost. I do like the knobby texture of the handmade spaghettini. Scrambled eggs, bacon, homemade braised beans, grilled tomato, beef sausage, confit button mushroom, roasted pumpkin and toasted brioche with seasonal jam. That's a LOT of food. We couldn't finish this. 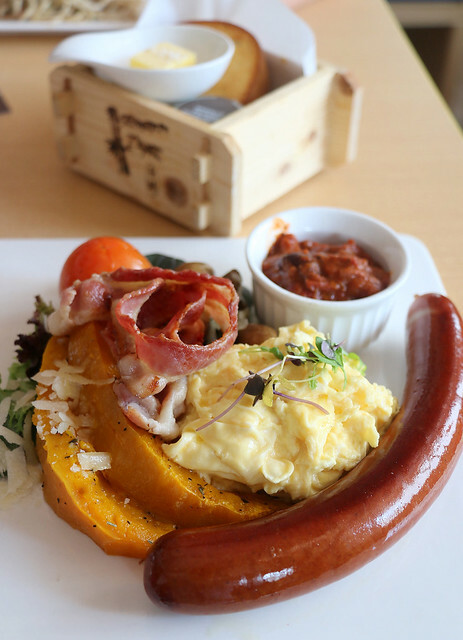 I like how the eggs came in silky folds, but the awesome-looking sausage turned out to be a bit bland. Portions are really huge here. We had no room for dessert although we had been eyeing the Edith Mess. Much of the food is meant to be paired with beer (and they do have quite a selection), but the one we had wanted, the Jaipur, an India Pale Ale from Thornbridge Brewery, was sold out. I was also eyeing someone else's Egg Benedict (I think). Looked so good, I had to snap a photo. Love the back wall - Live Well, Laugh Often, Love Much. That's all you need in life. So that was how my Chope experience ended. Very smooth, fast and easy reservations any time of day, with a pretty good selection of restaurants to choose from.